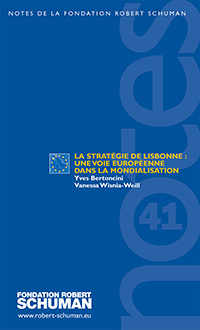 The Lisbon Strategy focuses firstly on a specific diagnosis of the economic challenges facing EU Member States in view of the results achieved by their main competitors, notably the USA and Japan: decline in terms of wealth and productivity, backwardness in terms of innovation. Within this context the Strategy promotes two types of structural reform: the first traditionally implies increased liberalisation of the European markets, the second calls for the support of production factors that generate endogenous growth, these notably being research and development or education. The Lisbon Strategy is applied via “an open coordination method,” of action undertaken by the EU and its Member States which logistically leaves the latter with ample room to manoeuvre given the nature of the economic and social stakes involved. It is based on the joint definition of operational goals by 2010 which are party of “integrated guidelines for growth and employment” included in Community and national action plans (“national reform programs”); there is a regular, detailed assessment of the results achieved which aims to encourage the EU and its Member States to take action. The Lisbon Strategy has given rise to both encouraging and contrasted results. Although overall the results appear to be average given the two main objectives of growth and employment levels established in Lisbon, they seem more positive when compared with other objectives established by the European Council since 2000. Above all assessment of all Member States reveals that several of them are already demonstrating extremely encouraging results with regard to the Lisbon Strategy objectives and that others, including France, are able to show significant progress. This progress is to be confirmed in 2008 thanks to a review of the “integrated guidelines” and the presentation of new “national reform guidelines”.